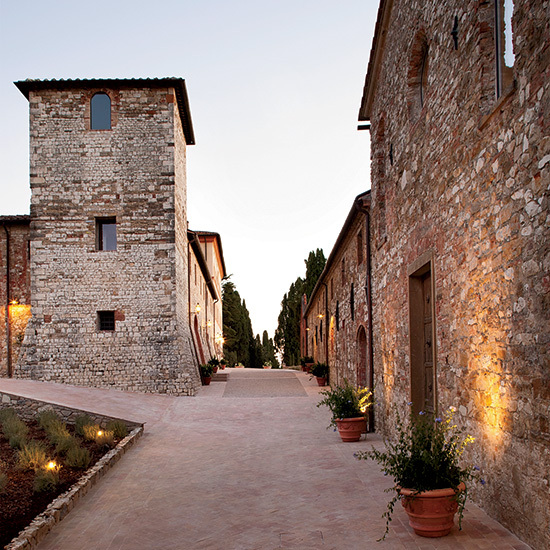 Once the home of the noble Bargagli family, Castello di Casole is now a resort with an undeniably regal feel. Once the home of the noble Bargagli family, Castello di Casole is now a resort with an undeniably regal feel. At the end of a road lined with towering cypress trees is a sunny yellow stucco castle of 41 elegant suites; private villas overlook the 4,200 acres of vineyards and olive orchards. Once guests settle in, they have little reason to leave. There's a world-class spa in a former wine cellar (rubdowns use Castello's own olive oil) and a glass-tiled infinity pool. The bar and restaurants, run by chef Daniele Sera, are devoted to both classic Tuscan cooking and more modern renditions, like a delicate spring risotto with garden asparagus, shrimp and saffron. As a reminder of the resort's noble roots, the staff will arrange hunting excursions for pheasant, hare and boar, as well as black truffles. Suites from $480; castellodicasole.com.